In rural communities across America the availability of an adequate and safe drinking water supply is mostly taken for granted. After years of investments by local communities, supplemented by funding programs such as those operated by USDA Rural Development and the EPA’s State Revolving Funds (SRF), most rural communities are now served by community water systems. However, new regulatory requirements, increasing water resource limitations, population growth, and under-investment in maintaining and improving water and wastewater infrastructure threatens to undermine the gains made over the last fifty years. Some might wonder why much attention should be paid to the fate of rural community water systems. In the short discussion that follows I would like to present several reasons why such investment is needed to ensure the continued prosperity of both rural and urban communities. Perhaps the most difficult aspect of this issue revolves around the sheer number of separate water utilities that exist to provide water services in rural communities. Unlike other infrastructure such as electric or telecommunications, it is not economically feasible to construct water service grids that connect customers over large geographic areas with a small number of customers. Of the approximately 55,000 community water systems in the United States, over 80% serve small communities with populations less than 3,300. In addition, the vast majority of the 16,000 publicly owned wastewater treatment systems serve small communities. These small, typically publicly owned utilities represent the most expensive investment that a rural community undertakes. The funding requirements to maintain these systems for the next 20 years are staggering. Every study completed over the last few years has pointed out the magnitude and potential dangers of not funding critical water infrastructure. The Environmental Protection Agency, the American Society of Civil Engineers, the American Water Works Association, and the Water Infrastructure Network have all published studies showing the needs ranging from $300 Billion to over a $1 Trillion in needs over the next 30 years.1 Rural and small water systems’ needs that serve only nine percent of the population are at least $59 Billion, while wastewater needs are nearly $25 Billion. Based on current expenditures there will be a major funding gap over the next 30 years, represented in the table below from the recent ASCE report. 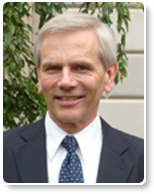 While there are currently various attempts to direct more funding into water and wastewater infrastructure (such as an Infrastructure Bank, a Water Trust Fund, a Water Infrastructure Finance and Innovation Authority, and reauthorization of the SRFs to name a few), the prospects are not bright for these or any programs to be created and funded at a level to meet these documented needs. So what is the impact of this underinvestment in rural water needs? First and foremost without adequate investments public health will be compromised and our watersheds adversely impacted. Small rural water systems have by far the most contaminant violations and many of these require expensive treatment techniques that are unaffordable for small systems without public financing programs. In addition, most rural areas rely on septic or onsite waste disposal systems and many of these are not functioning properly. There is also a high incidence of “straight-pipe” where wastewater is discharged directly onto the ground or into water sources without any treatment. Poorly functioning wastewater systems add nitrates to ground and surface water impacting water withdrawals from aquifers and aquatic life in our streams, rivers and lakes. Most large urban areas rely on rural watersheds for their drinking water supplies and contamination of this source adds significant costs for drinking water treatment. 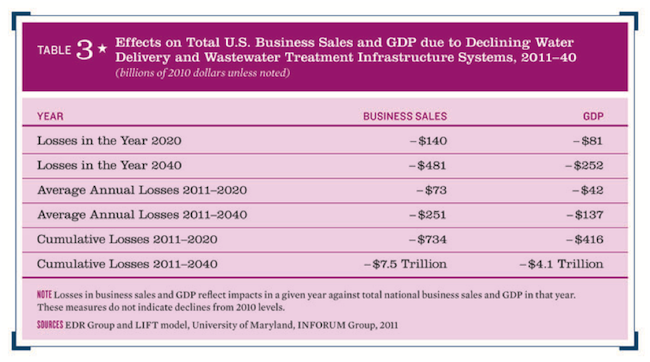 Investment in rural (and urban) water infrastructure has significant economic impacts. Infrastructure construction creates employment opportunities not just associated with contractors and suppliers involved in the projects. Adequate and affordable water systems are the foundation for any rural economic development initiative. Business development and expansion is supported by having these systems in place. A recent study by the U.S. Conference of Mayors2 reported that one dollar invested into water and wastewater infrastructure leads to a long term GDP increase of $6.35. 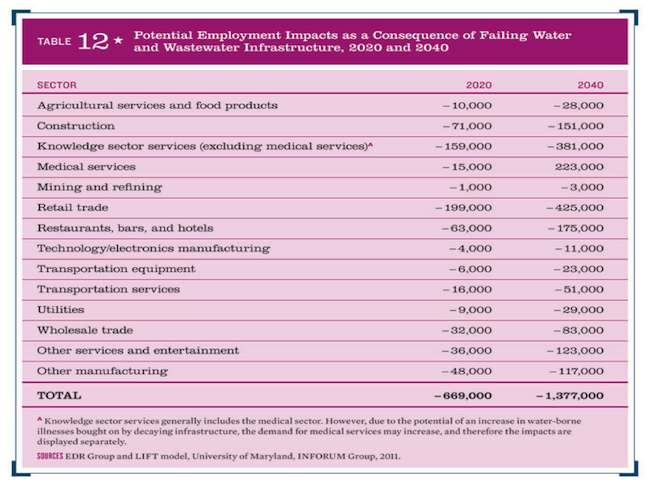 For each dollar spent operating and maintaining water/wastewater infrastructure, economic output for all industries increases an average of $2.62. These investments also have major impacts on job creation. This study further reports that each job added in the water sector creates 3.68 jobs in the national economy to support that job. On a national basis every $1 Billion spent on upgrading or maintaining water sector infrastructure creates an estimated 42,000 – 57,000 jobs. Finally there is a direct correlation between this public infrastructure investment and private investments. Every construction dollar generates nearly $15 of private investment and adds $14 to the local property tax base. Furthermore investments in water infrastructure produce greater economic activity than other infrastructure investments, such as road and bridges. Without addressing the gap between what is required for water infrastructure investment and what is projected to occur with a continuation of existing policies will result in significant negative economic impacts. 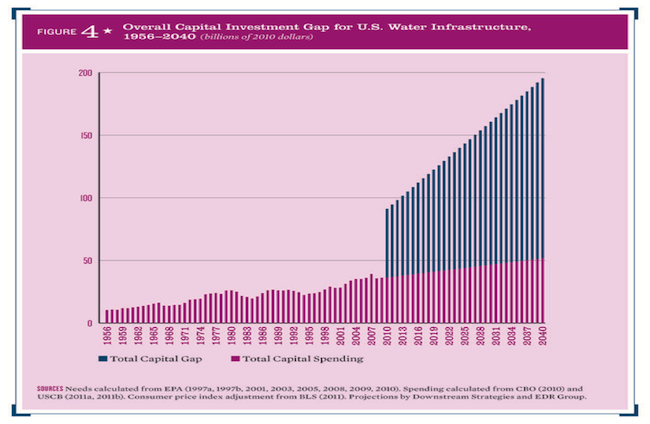 The ASCE Report graphically illustrates this current and future investment gap. Without sufficient investment economic activity is projected to decline significantly in the next 30 years as shown below. In addition the impacts on employment across a variety of sectors will be negatively impacted. Each year the Rural Community Assistance Partnership works with over 2,000 rural communities on water, wastewater, solid waste, affordable housing and community development issues. Our staff across America sees the impacts of deferring or eliminating investments in water infrastructure. Rural communities support vital agricultural activities, oil and gas exploration and production, mineral extraction industries, forestry, recreation and a variety of other economic pursuits. With the expansion of broadband coverage to rural communities there are now more opportunities to locate internet dependent industries in these areas. Far too frequently the interdependence among rural and urban areas is overlooked. While the population in rural America may be small, rural economic activity impacts everyone regardless of their location. Watersheds that must be protected serve both rural and urban areas. Given the potential economic impacts of adequate water infrastructure investment, why are we as a nation so reluctant to make these investments? Material and construction costs will only increase and under the current economic climate the costs for borrowing will probably never be lower. Is this just a simple lack of awareness on the part of the public and our policy-makers? As we continue to neglect these investments other industrialized countries are more than doubling our level of investments. So will it take numerous outbreaks of water borne diseases (such as was the case in Milwaukee or Alamosa) to catch our attention? Will water dependent industries, including those involved with biofuels, be neglected or forced to look for other locations around the world? It has been repeated many times but it is still true that we are now reaping the diminishing benefits of infrastructure investments from 30-50 years ago. To ensure our future we must engage in meaningful discussions on these issues and bring in policy makers and legislators who can advocate for the level of infrastructure investment that is necessary to secure our continued economic prosperity.